Financing your studies may seem daunting at first, but help is at hand. The University will provide all the support you need to take control of your finances. For fees purposes, the University classifies students as UK, EU or international. Your residency classification determines the amount you pay in tuition fees as well as the financial support available to help towards tuition fee costs and living expenses. Alternatively, click this text to go to the Fees Policy itself in a new tab. Application Fee for BA (Hons) and FdA Acting courses is £50. The annual tuition fee for UK and EU undergraduate students commencing their studies in 2019 will be £9,250. This includes students from the Channel Islands and Isle of Man. The tuition fee for international (non UK/EU) students on our undergraduate technical courses, will be £20,400 per year. 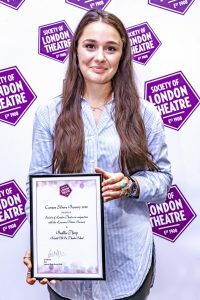 UK/EU Tuition fees for the Four Term MA Theatre Design and MA Drama Directing Courses starting in April 2020 will be £13,175 for the whole course. All four terms. Tuition fees are likely to increase in each subsequent year and these increases will be in line with UK Government policy. What does it mean to be ‘means-tested’ or ‘financially assessed’? Your household income is made up of your income plus that of the people who live with you, such as your parents / step-parent / partner. Household income is assessed based on gross taxable income for the last full tax year. If your household income is likely to drop by at least 15% you can request a Current Year Income Assessment Form from your regional funding agency. Please click here to view a Student Finance Explained leaflet from Student Finance England – View here! The UK Government has announced a new loan for Masters students, starting from the 2016/17 academic year. This scheme will be administered by Student Finance England alongside the undergraduate funding programme. The Department for Work and Pensions (DWP) may take account of the loan when working out any benefits you receive. The amount you’ll get depends on when you started your course. It is not based on you or your family’s income. You can get up to £10,000. If you’re studying for 2, 3 or 4 academic years, you’ll get the first half of the loan in your first year and the rest in your second year. You get the first payment after your course start date, once your university or college confirms that you’ve registered. The loan will be paid in 3 instalments of 33%, 33% and 34% each year. After your application has been approved, you’ll be sent a letter with your payment dates or you can check them in your online account. As you would expect from a university that places great emphasis on student support, BOVTS is keen to offer help to students. Bursaries and scholarships worth almost £200k are available for new and returning students. The Undergraduate Award Scheme is part of The Conservatoire for Dance and Drama’s (CDD) Access Agreement with the government and is aimed at widening access to degree courses by removing financial barriers to education for students from under-represented groups. The Conservatoire offers a range of scholarships in the form of bursaries and fee discounts. See the link below for details of what the scholarships are worth and who is eligible. You can apply to Student Finance for income assessment even if you are not eligible for a loan, or do not wish to apply for a loan. Scholarships awarded on the basis of talent will be allocated by the schools and all eligible students will be considered. If you are eligible for an income assessed scholarship, you may also be considered for additional support through the ‘talent and need based scholarships’ criteria. The maximum amount you can receive is usually £4,000 per year for each year of training. These bursaries are for £5,000 per year tuition fee discount (£10,000 for the whole of the two year course). By applying for the course applicants are automatically entered into the bursary application system. On Thursday 23 June 2016 the United Kingdom voted to leave the European Union. The government has confirmed that EU students starting in 2017/18 and 2018/19 academic years will be eligible for home fee status. This means that they will be charged the same tuition fees as UK students throughout the duration of their course. Current EU students who have been assessed as eligible to receive loans and/or grants from the Student Loans Company, will continue to receive these loans and grants until they finish their course. This will also apply to EU nationals who intend to begin studying from the autumn of 2019. The UK Government has agreed that for the academic year 2019/2020 EU students at Universities in England will continue to be treated the same as home students in the first intake after Brexit. This status will last for the duration of their degree courses.